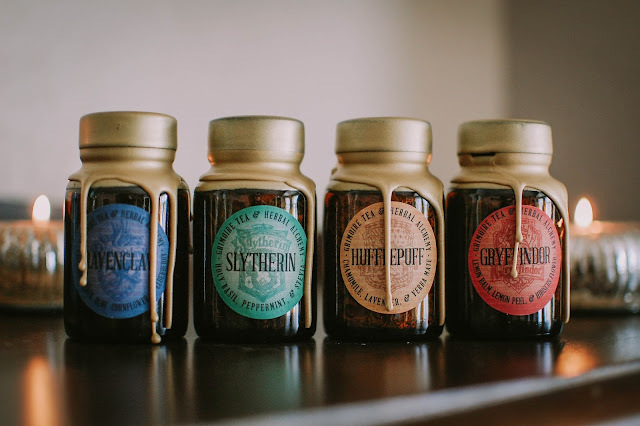 My friend Valerie tagged me in a post on Grimoire Tea's IG about a Hogwarts tea sampler. I set my clock for the release and then headed over to Etsy to pick mine up at the scheduled time. 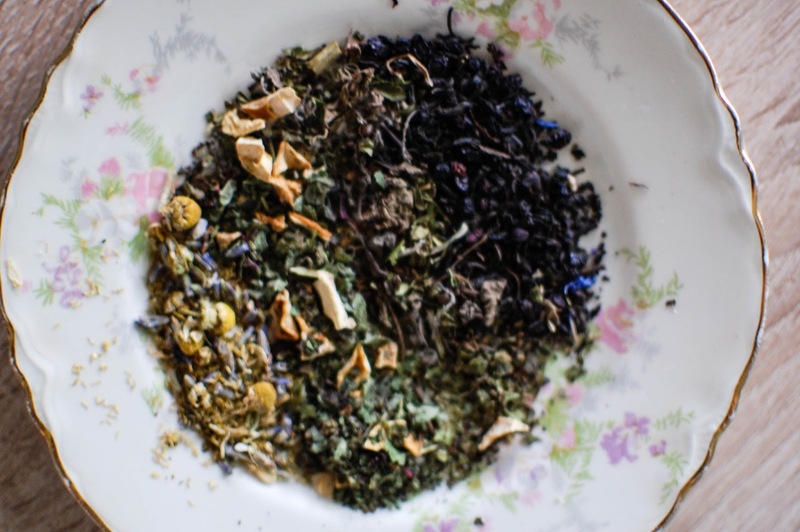 Four house loose leaf teas cost $24 plus $5 shipping. Each bottle will make 10-15 cups of tea depending on how much you use/preference for strength. This was a pre-order and took a couple weeks to ship. There was a minor issue with the shipping. Grimoire sent it in a regular envelope mailer instead of a flat rate, so I owed a little over $3 in shipping upon arrival but they refunded me the difference. Samantha was right on it and even messaged me before it arrived to tell me about the situation and that she would refund the extra postage due. Slytherin- Holy basil, peppermint and stevia. Glorious. Peppermint woods. 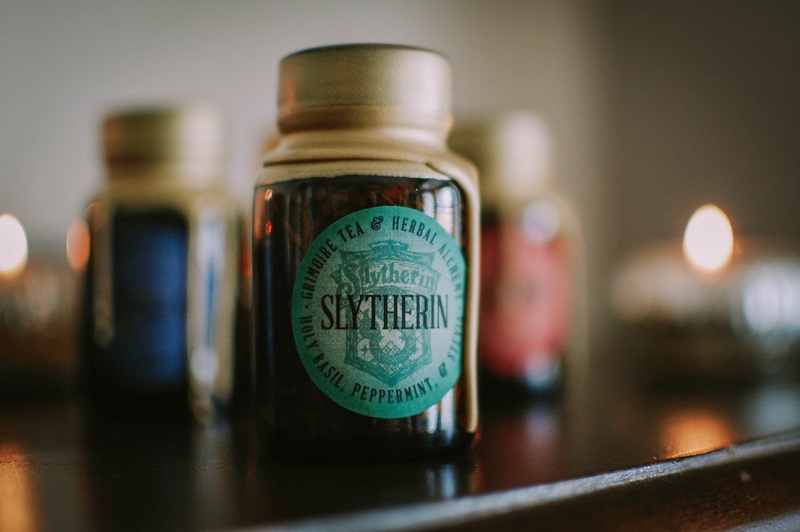 Steeped and steaming, the peppermint inevitably brings to mind my beloved peppermint and Sleepy Time teas. This version however, does have a bite. There is a touch of woods and star anise in there and the stevia contributes a natural sweetness. No additional honey or sugar for this cuppa wicked relaxation. Holy basil belongs to the mint family and is a cousin to sweet basil. It is one of the most cherished of India's sacred healing plants. 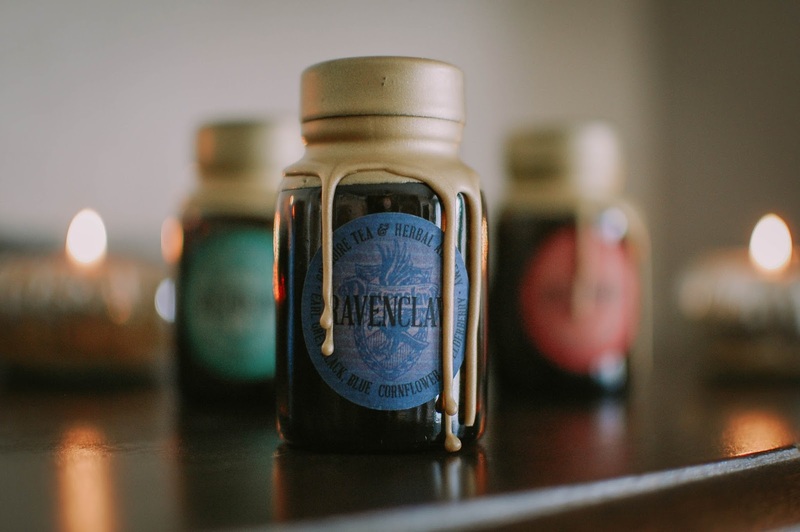 Ravenclaw- Earl Grey black, blue cornflower, elderberry. A bergamot and lavender leaning Earl Grey with soft floral tones and peppercorn sized dried elderberries. The aromatic flavor mimics the same. I don't pick up on any outright fruity tones from the elderberry but they do support healthy immune system functioning. I prefer this black tea with a touch of sugar and cream. It is a wonderful morning staple. 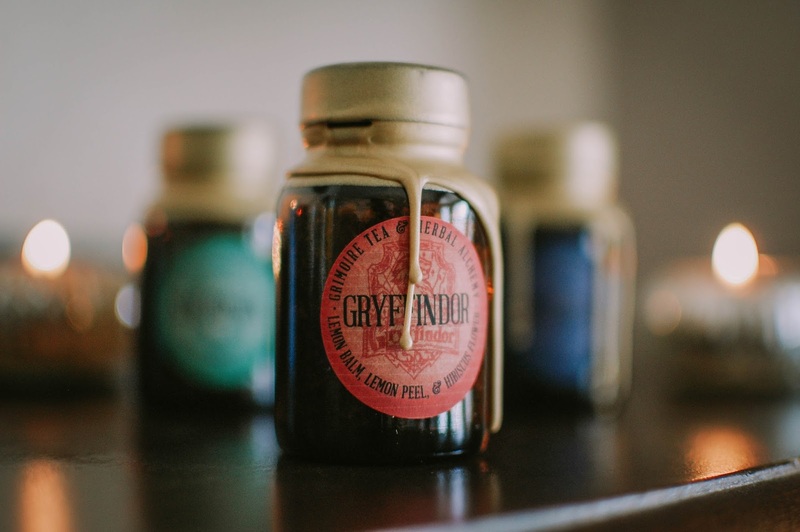 Gryffindor- Lemon balm, lemon peel and hibiscus flower. And herbal lemony dream. Bold and slightly sweet. Once steeped, it reveals a lovely red tinted liquid that tastes lemony bright and herbal with a touch of fruity sweetness from the hibiscus. The lemon balm is said to calm the heart and body. 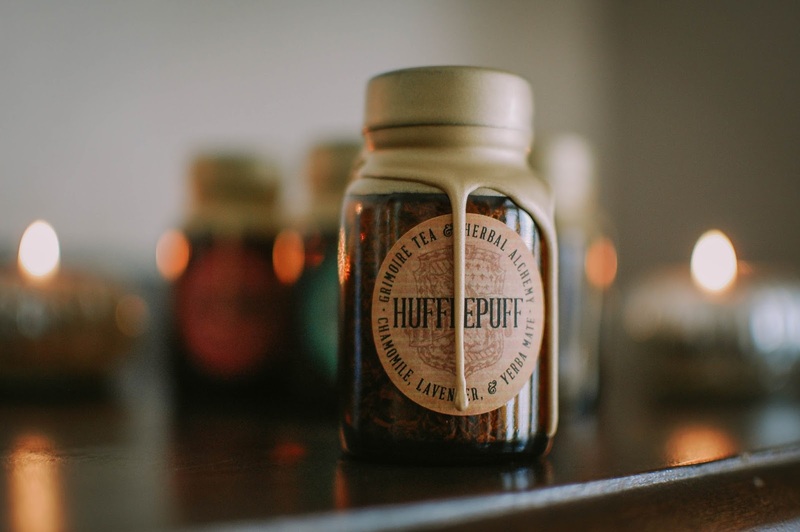 Hufflepuff- Chamomile, lavender and yerba mate. Smells like chamomile green tea, a little sweet and very deep. The lavender buds are a beautiful and aromatic touch. It tastes like a mellow green tea with a touch of the chamomile and sleepy type teas without the mint. Yerba mate has been used to treat mental and physical fatigue, as it does contain caffeine. Please excuse my very awful out of focus shot of the the tea leaves, but I did want to give you some semblance of what the tea looked like. From left to right: Hufflepuff, Gryffindor, Slytherin, Ravenclaw. Are you a tea nut? I have been off coffee since Monday, June 5th. I not only need to drink the tea I have sitting around but I am trying to get on track to better health. Now don't get me wrong... I am not giving up my coffee forever, just for now. Do you have any teas you are loving hard right now? I did pick up a Mother's Day Sampler from Grimoire I will share soon. Well, I couldn't have picked a better morning to sip on my peppermint tea than this! 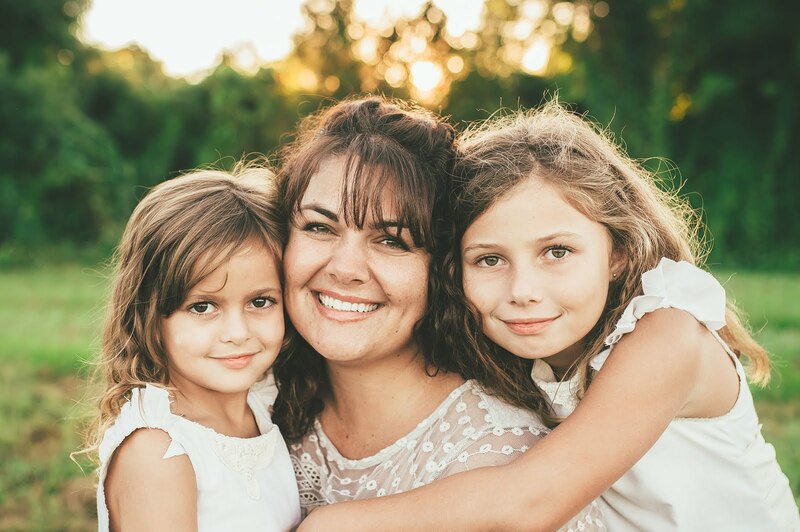 I am trying to get in the swing of trying to drink it more from time to time to see if it helps with some of the problems I have been having that it is supposed to help soothe. It is an acquired taste for sure but not too bad! These are soo fun and creative!! You will have to recycle the bottles someway after they are used up. How great is peppermint tea?! I love the stuff. Hoping your tongue comes to love it too. I will definitely be looking for a use for the bottles. I could not bring myself to toss them. Too much cuteness. These teas sound wonderful and you are on point with the Harry Potter themed merchandise lately! I am in a Potter renaissance. I think I need to read the series again soon. We have been watching the movies a lot lately and we bought Fantastic Beasts and watched that a few times already too. Maybe that is why. Mmmmm, green tea with mint and honey is so great. I also love making it iced and adding lime to it. YUM! I'm not a tea drinker but dang! I'd buy this set and never open them, just because they look so cool. They'd find a place on a shelf in my eventual library. I've tried to drink tea a couple times but it must be an acquired taste. I have to add so much extra sweetener that it's like, what's the point? I can drink bottles of the cold, sweet teas but just can't seem to do it with 'real' tea. They do look so cool! And not bad for the price. I will certainly be keeping them for some sort of use. I can see that. Tea took me a little while to glom onto. But I like it a lot now. I have one you might like though... it is sweet and spicy. Do you like to drink spice like in cider? I quite like tea, although I have a real Brit's approach to it - nothing too fancy, just Earl Grey in a bag, hot, one sugar cube, and lots of it. Mugs EVERYWHERE. I think so too!! There has to be some wax sealed letters and parchment floating about the castle for sure. I just love wax seals and watching people use them. Strangely comforting. A classic tea wench. Love it. Early Grey is such a nice blend though. Can't go wrong with it. Mugs! They are fun aren't they?! I am eyeing some nice pottery mugs but I can never seen to order them fast enough. Leave it to me to find the Hunger Games of the pottery world (Ox and Otter). Also, if I gave up coffee, results would be cataclysmic. There would be no survivors! I agree! I am very thankful for that friend looking out for me. I am almost halfway done with the Mother's Day sampler ones I bought from this company. They taste really nice. You are a black tea girl right?